The Brashear process is commonly used to silver the internal surfaces of Dewar flasks, which are evacuated double-walled vessels (much like a Thermos® bottle) used for handling and storing laboratory cryogens such as liquid nitrogen and liquid helium. 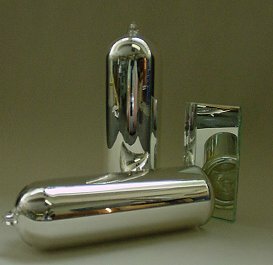 The combination of the evacuated double-wall and silver mirror surface greatly reduce heat transmission from the inside to the outside of these vessels. The chemistry of this process is described in the Tollen's test which is a physical method that tests for the presence of aldehydes in an organic chemistry laboratory. A video of this process is available through the Royal Society of Chemistry. 2 liters distilled water, 50 grams silver nitrate. Store in a dark glass bottle. 2 liters distilled water, 90 grams potassium hydroxide. 800 ml distilled water, 80 grams cane sugar, 100 ml ethyl alcohol, 3.5 ml nitric acid. Age 30 days or boil 30 minutes before using. To use: First ensure that your glassware to be silvered is scrupulously clean. Then, add concentrated ammonium hydroxide dropwise to Solution 1 with stirring. It will form a precipitate with the first drop; continue adding until the precipitate clears. This should require no more than an eye dropper's worth of ammonium hydroxide for volumes up to ~500 mL. Add Solution 2 to Solution 1. The combined solutions will have a creamy white precipitate. Stir the solution and again add concentrated ammonium hydroxide dropwise until the solution is slightly cloudy. Pour the solution into the glass vessel to be silvered. Add solution 3 and stir/shake while the mirror develops. Warning: Wear protective clothing and read the MSDS for all materials that you use. Promptly and safely discard unused mixed solutions. We hope to post some pictures here that demonstrate a Dewar flask being made. Stay tuned!